While poring over data collected by the European Space Agency's XMM-Newton spacecraft, a team of researchers spotted an odd spike in X-ray emissions coming from two different celestial objects — the Andromeda galaxy and the Perseus galaxy cluster. 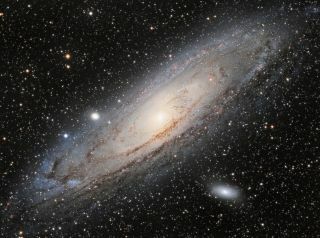 "The signal's distribution within the galaxy corresponds exactly to what we were expecting with dark matter — that is, concentrated and intense in the center of objects and weaker and diffuse on the edges," study co-author Oleg Ruchayskiy, of the École Polytechnique Fédérale de Lausanne (EPFL) in Switzerland, said in a statement. "With the goal of verifying our findings, we then looked at data from our own galaxy, the Milky Way, and made the same observations," added lead author Alexey Boyarsky, of EPFL and Leiden University in the Netherlands. Dark matter is so named because it neither absorbs nor emits light and therefore cannot be directly observed. But astronomers know dark matter exists because it interacts gravitationally with the "normal" matter we can see and touch. Researchers have proposed a number of different exotic particles as the constituents of dark matter, including weakly interacting massive particles (WIMPs), axions and sterile neutrinos, hypothetical cousins of "ordinary" neutrinos (confirmed particles that resemble electrons but lack an electrical charge). "Confirmation of this discovery may lead to construction of new telescopes specially designed for studying the signals from dark matter particles," Boyarsky said. "We will know where to look in order to trace dark structures in space and will be able to reconstruct how the universe has formed."